A vest is a splendid, universal clothes which perfectly suits spring-autumn, and a cool summer or a warm winter. In fact a vest is a jacket but without sleeves. Thank to this construction it is not hot in a vest, a body has self-ventilation. On the other hand, back and chest are secured, that is especially important when the wind is strong. It is comfortable to drive a car, spend time outdoors, walk along the city in a vest. You may wear it with jeans or sports trousers, with skirts or trousers. Just for you Nordwestfur company presents several variants of vests in different colours for men and women. We offer you vests of three optimal colours. The models are with a high collar which is knitted inside and protects a neck perfectly. Reliable zippers will not break even in case of frequent zipping and unzipping of the vest. Model Elegance Vest Winter with a fashionable garment which makes squares across the whole fabric. A vest has big comfortable pockets two of which inside ones, and two are outside ones. One more peculiarity of women’s vest is their length which is midthigh. Vests have a removable hood, and the model itself is semifitted that makes a woman’s figure even more graceful. Men’s vests Classic Vest Winter are presented in two colours – dark blue and dark grey. It is a very utility model, loose enough not to constrict movements, but still not too loose and to remain well fitting. Men’s vests are shorter than women’s ones, so it is more convenient to drive a car, to move faster, etc. Vests are also furnished with four pockets. The outfits have knitted collars, each outfit has a removable hood. Both models for men and women are produced of high quality materials. The fabric does not soak through, protects from wind. 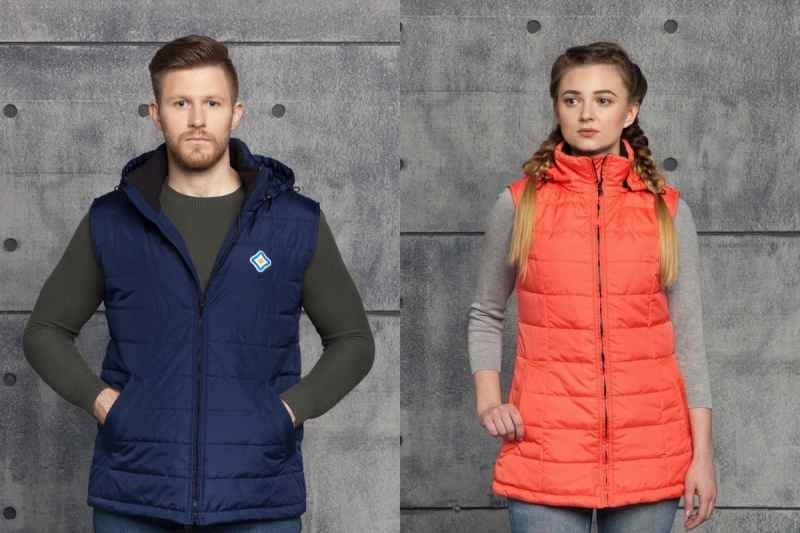 Vests are appropriate for thermal regime from minus 5 to plus 5 degrees. The peculiarity of both models is their small weight, moreover, they can be wrapped veru compactly, so you can take it with you to the nature. One more advantage of vests Nordwestfur is that they are easily washable in washing machine, they get dry fast, and herewith they keep their original appearance and form. There is a two years guarantee for men’s and women’s vests. You may either buy a ready-to-wear item of your size, or make an order for a vest according to your measurements.